The brand new Dressing Your Book and So Much More Amazon aStore is open and ready for ordering. What this store does is links all of the authors I work with on one page and you can go and look at all of their work in one place. All you do is click on a title and it takes you to the ordering page for their book. Christmas is coming soon but there is still time to order and get them by the big day. Everybody remember back on October 29th I told you were were going to be doing a fundraiser to get a grave marker for Pauline Metler, the victim in the book The Last Rites. Being the curious sort that I am I went to the cemetery this past weekend and found her new grave marker. I am told it has only been up for about a month but it is now there. While her name at the time of her death was Pauline Metler her family knew her as Pauline Marshall thus explaining the name difference on the grave marker. Check out the pictures that were taken on that visit. There is no date of death just the month and year. If you want to find out why then read the book The Last Rites by Yvonne Mason. Available on Nook, Kindle, Amazon. Writing a book, magazine article, newspaper article, thesis or any other type of paper? Love to write but hate to research? Just give me your topic and I will do the research for you. Simple to complicated, vague to detailed I can do it all. Prices vary based on what work is requested. Please contact me for more information. With enough interest I may develop an entire research department. Pauline Metler may have been forgotten by her family but not by the author of this book. We are working together to create a fundraiser to help get a grave marker done for Pauline. Check here and on Facebook for information comng in the next few days. We never think about the fact that when our loved ones walk out the door for a destination that it might be the last time we ever see them. We just assume they will walk back into that door with a greeting of “Hello”. But sometimes they don’t especially if they are a free spirit and never know from one minute to the next what they are going to do. Pauline Metler walked out of her trailer in Melbourne in 1975 hitchhiking to Key West. She told those she left behind that she would be back in a few days. She started here Journey on US1 in Melbourne headed south. She was never seen or heard from again. No one ever reported her missing. Several days later the decomposed remains of a body was found on Ulrich Rd in Fort Pierce. This body was found by two strangers who just happened to be in the right place at the right time. The body had no identification. When law enforcement started working the case they had nothing to go on until her false teeth were identified. Her name was Pauline Metler. She was 33 years old. She had lived in Key West and was married to Donald Metler That was all anyone knew. It took several more weeks before law enforcement could find out where her family was or if she even had any. When they did find out and went to talk to them – law enforcement was lied to about her. The family refused to cooperate. The so called friends she had refused to cooperate. No one would talk to the investigators. When the body or what was left of the body was released for burial Donald Metler refused to claim it. No one else in her family claimed it either. Sadly she was finally buried in an unmarked grave by the County in a pauper’s section of a city cemetery in Fort Pierce. To this day she still has no headstone to show that she ever existed. Her legacy is that unmarked grave. 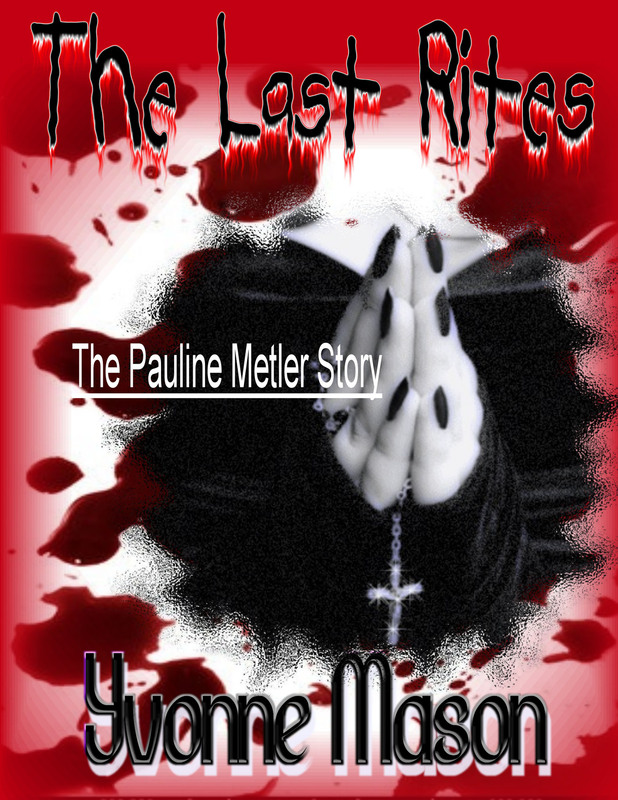 “The Last Rites” is her story. It is her legacy in book form. It is a tribute to a young woman who was brutally raped and executed simply because three men had an urge and could. Pauline Metler was a human being who didn’t deserve to die in this fashion and then to be tossed in an unmarked grave for whatever reason. She deserves to be remembered because she lived. She loved was loved and because she was a person. Who is to say what she might have done with her life had it not been cut so short. Who’s to say what she might have accomplished had she not been picked up that day on US1. The question will always remain in my mind Why didn’t someone care enough? This is my way of caring. This is my way of remembering and letting the world know she existed. Read her story, keep her memory alive. Understand that none of us are exempt from the same type of fate. This is the book I have been working on for the last two weeks. It is a compilation of short stories written from notes made by someone with thoughts in their head as they went to sleep. It will be getting published soon so look for it on Amazon, Kindle and Nook soon. Stay tuned for more information on this coming to a bookshelf near you book. Had a great meeting this morning with a young man who has written a book but did not know what to do once he wrote it. He is my newest client. Look here for updates and information on the release of his book. Thanks to my dear friend Yvonne Mason also an award winning Independent author who introduced me to this young man.